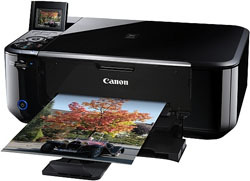 CNET UK has tested a new Pixma printer from Canon called Canon Pixma MG4150. The Canon printer is able to print up to 9.9 images per minute, or so Canon claims, and you can print directly from your phone with this printer. CNET UK ends up giving the MG4150 an overall score of 3 out of 5 possible stars. The reviewer likes aspects such as onboard wireless printing, it is relativity cheap to run and it makes good text prints. There are a few negative points hindering the inkjet printer from getting a higher score including slow print speeds and the graphic prints could been better. If you are looking for a cheap printer that is able to print from your cell phone or tablet, this might be your choice if you can live with the slow print speeds. Read the full review of the Canon Pixma MG4150 web-enabled All-in-One printer here.